Buffalo painter A.J. Fries is known, where he is known, as one curmudgeonly customer. Across his successful career in Western New York, he has cultivated a public persona that falls somewhere between Larry David and Grandpa Simpson, with a dash of Dave Attell thrown in for good measure. But all that melted away one January evening in 2012, when he saw Karen Eckert walk past the window of the Chippewa Street restaurant where the couple had their first date in January 2012. 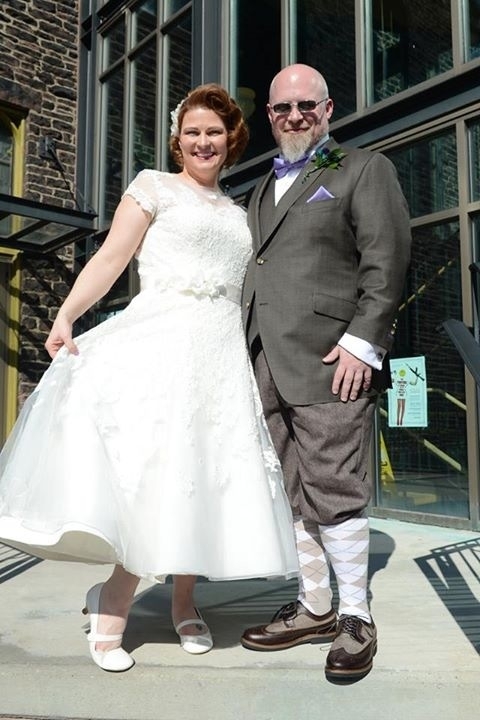 Indeed, Fries’ tendency to drop offensive jokes and stir the pot was a main theme of a speech delivered by the couple’s friend, Adam Weekley, who heard their vows in an April 11 ceremony in Asbury Hall. The two met in the typical modern fashion: via Match.com. Fries spent about a month messaging back and forth with Eckert, finally convincing her to go out to dinner at Papaya on Chippewa Street. It turned into an eight-hour evening, complete with a visit to Fries’ studio in a Larkinville warehouse and a tour of what used to be the Larkin Soap Company. Fries said he knew she was the one when he left his studio briefly during that date and returned to find Eckert cross-legged on the floor, paging through one of his art books. For Eckert, a teacher at Springville-Griffth Institute and adjunct professor at Erie Community College who graduated from Sacred Heart Academy, SUNY Fredonia and SUNY Buffalo State, Buffalo’s artistic community welcomed her with open arms. “They just accepted me completely and I feel like I’ve gained so many friends and such a community of close-knit people,” she said. She proposed to Fries by buying him an antique watch he’d had his eye on from a dealer on Hertel Avenue and showing up, with her daughter in tow, at an Allen Street restaurant where he was hanging out with friends. At first, Fries was disappointed because he thought Eckert had overspent on a gift for him. The change from the life of a bachelor and a working artist has been a bit more challenging for Fries, who attended St. Joseph’s Collegiate Institute and SUNY Buffalo State and has paintings in the collections of the Albright-Knox Art Gallery, Burchfield Penney Art Center and numerous private collections. The bride’s parents are Mary Cay and William Eckert of Springville. The bridegroom’s parents are the late Helen and Franklin Fries. After a trip to Seneca Lake, the couple will make their home in Hamburg.